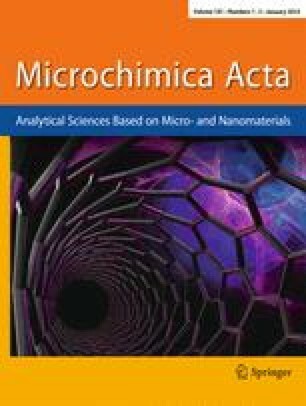 A sensitive spectrophotometric method is developed for the determination of small amounts of molybdenum based on the extraction of molybdenum-thiocyanate-4-acetyl-2-(acetylamino)-5-dimethyl-Δ2-1,3,4-thiadiazole complex into chloroform from hydrochloric acid medium which is orange red in colour. The complex has an absorption maximum at 470 nm with a molar absorptivity of 2.01×104l·mole−1·cm−1. Beer's law is valid over the concentration range 0.06–2.5 ppm of molybdenum with an optimum concentration range of 0.15–2.2 ppm. The ternary complex is stable for over one week at room temperature. Equilibrium shift method indicates 1∶4∶2 composition for molybdenum-thio-cyanate-4-acetyl-2-(acetylamino)-5-dimethyl-Δ2-1,3,4-thiadiazole complex. The effects of acidity, reagent concentrations, time, temperature and diverse ions upon the absorbance of the complex are critically assessed. This method has been used successfully for the determination of molybdenum in molybdenum steels.